Jenner is set along the Pacific coastline. The transition to the coastal environment begins around Duncan's Mills and completes at the river's last bend before flowing into the ocean (see the picture at the left). 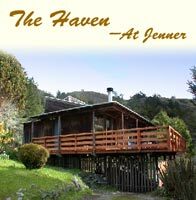 Jenner offers fine River and Ocean view dining, great vacation rentals, romantic lodging and unique gift shops. Jenner is a short drive from spectacular cliffs and accessible beaches including Goat Rock State Park. There are a couple of restaurants with spectacular views in Jenner. 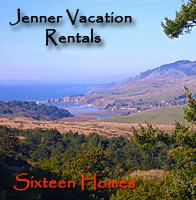 There are five lodges in Jenner and several vacation rentals. They are the Fort Ross Lodge, Salt Point Lodge, Jenner Inn, River's End Inn, and Timber Cove in. Only Jenner Inn and River's End Inn are in the town. The other three are up the coast. 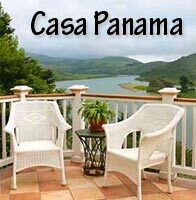 There are also great vacation rentals to choose from. The easy coast beach access is at the south side of the river's mouth at Goat Rock. Take Highway One south of Jenner until you take a right onto Goat Rock Road after crossing the Russian River and heading up a bit of a hill. To access the beach on the north side of the mouth you have to hike down the cliffs (there are trails but they are steep). The island in the middle of the estuary just out from Jenner is Penny Island. If you paddle out there you may walk around and explore if you wish as it is part of the park land. The mouth of the river is a home and birthing location for seals. The main attraction is being at the river's mouth. This is the intersection of the river and coast ecosystems. Consider renting a kayak to paddle around the estuary. During seal pupping season when you head towards the mouth you can see the seals swimming along next to you. The air is always incredibly fresh in Jenner, especially when you walk down by the river - it's invigorating. Goat Rock beach is a great place to have a picnic with the dunes, rock formations, pounding surf and dramatic hiking trail. There is a coffee shop. There is a gas station in Jenner and it is the last gas station for a bit going north or south. Jenner, CA - this little town looks over the mouth of the Russian River and the Pacific Ocean. Goat Rock State Park is a wonderful place to catch a sunset or walk the beaches.